Every so often something like this happens: a manufacturer discontinues a product that people love in the name of “progress,” only to come out with an ill-suited “replacement” or, worse, no replacement at all. It happened a lot with, say, British sports cars in the 1970s and 1980s (think Triumph TR6 and TR7, or MGB and MG Metro), and in later years with products like the Apple Newton. Unfortunately, it happens with shoes as well. Take the Puma H-Street, for example. This shoe was the absolute favorite of PoseTech runners, with its minimal weight (5.8 ounces!) and sock-like fit and comfort. Running with these shoes was like running barefoot—bio-mechanically speaking—but with the added protection of a shoe. Despite their minimal weight, I got well over 850 miles out of my pair last year while running the fastest and longest races of my life (including a 50- and 64-miler), and they still should be good for a few more hundred miles. So after researching suitable alternatives, I settled on this one: the Puma Saloh, which came out around December 2007 or January 2008. The PUMA Saloh shoe is an update to the ever popular H-Street style. The PUMA Saloh gives the consumer a comfortable, breathable street shoe with the look of an original PUMA track spike. Indeed, as you can see from the photo at the top, the Saloh even looks a lot like the old H-Street. It is also very light. To date, I’ve run 206 miles in these since getting them 1.5 months ago, including six or so 20+ milers and a 6k race. Here are my impressions of the Saloh and comparison to the H-Street. The Saloh, while light, weighs 0.9 ounces more (6.7 vs. 5.8) than the H-Street. I can’t honestly tell the difference while wearing them, but a theoretical advantage goes to the H-Street. The Saloh actually has a slightly lower retail price than the H-Street ($65 vs. $69). I picked my pair up at the Puma Store in Boulder. Both shoes seem to share the same sole and tread pattern. The only difference is the Saloh’s sole is colored (dark blue on mine) instead of black like the H-Street. This suggests the Saloh’s sole contains less carbon black and, in theory, may be less grippy and not as long-lasting as the H-Street’s soles (if they are anything like tires—see Sheldon Brown’s article regarding carbon black). Honestly, though, so far I cannot tell a difference in traction, and there seems to be minimal wear on my Saloh’s soles after 206 miles. The Saloh has strips of synthetic “leather” at the front, rear, and top in front of the laces. The tongue is also made of this material. In contrast, the H-Street consisted of thinner, real leather for the tongue, and smaller strips of leather at the front and rear. The Saloh’s larger strips of synthetic leather is responsible for the weight difference. More significantly, the synthetic leather of the Saloh in front of the laces makes the shoe a tad less flexible than the H-Streets (I’d say the Saloh has 95% the flexibility of the H-Street). Also, the synthetic leather makes the Saloh slightly less breathable. The shoes also don’t compact down as much when, say, carrying them in your suitcase while traveling. The only advantage the extra synthetic leather provides, then, is perhaps better durability of the uppers and sides. The Salohs also look a little sharper to me, but that is subjective. The Saloh and H-Street both are comfortable shoes and seem to be sized exactly the same (I used size 9.5 for both). Verdict: The Saloh is marginally heavier, less breathable, and less flexible than the H-Street. Therefore, the H-Street is a slightly better shoe for running. I emphasize, though, that the difference is very slight. If you want me to speculate how this translates into time differences, I’d guess that the H-Street is 1-3 seconds/mile faster. This is pure speculation though and I haven’t done a controlled study on that. Puma certainly could have done worse with this “update.” Since the shoes feel so much the same and my old H-Streets still have some life in them, I’ll probably use the H-Streets for some races but use the Salohs the rest of the time. Let’s just hope Puma doesn’t discontinue the Saloh now. Hmmm, it may be a good idea for me to stock up on these. Update July 23, 2008: Puma has brought back the H-Streets! Hooray! Thanks to Conrad for letting me know! That’s a pretty accurate review.. I just got a new pair of Salohs cuz I was so in love with H street ones I have, but I did notice the subtle differences you mentioned since I’m picky as hell, but overall, I guess they’re pretty much the same… I do hate why manufacturers discontinue the products that people love the most; it unfortunately happens all the time! I always run without socks in the H Streets, but I need to wear socks in the Salohs. The leather in front of the shoes are rubbing my pinky toes leaving peeling off the skin there (it’s bloody too). Do you use the pose method of running or just run how your body feels like it should run when wearing these shoes (forefoot strike)? Is the tread grippy on moist or muddy surfaces? I’m thinking about getting a pair of Puma H. Streets which are now being made again by Puma. Don’t know what the NC stands for. Also, how would you say the sizing runs (half size big, half size small, etc.)? And do you wear them with toes right at the end of the shoe or a little space in between? Hi Conrad. Thanks for stopping by my site and for your comments. I do run with POSE-like technique, and when I switched to that (before getting the Pumas), it took conscious effort. I do imagine, however, that if one started out using the Puma H-Streets, he would naturally start running in a more POSE-like manner (with forefoot strike), since it much more uncomfortable to heel strike with the Pumas than with other shoes. This is because there is no cushioning under the heel with the H-Streets. It truly is kind of like running barefoot (it is uncomfortable to heel-strike running barefoot too). The tread is not very grippy, but it is long-lasting. I have no problems with H-Streets on pavement or dirt, and have even ran on some rocky or muddy trails with them, but this is not where they excel. The soles should be considered almost perfectly flat/slick and do not do well on ice or deep mud (I have tried and had to be a lot more careful and slower in those sections). Hey! Thanks so much for telling me that the Puma H-Streets are now back in production! I am really excited about that! Too bad I haven’t been running much lately at all! I’d say the sizing run normal. For street shoes I normally get a size 9, but for running shoes (since everyone’s feet swell a little) I have almost always gotten size 9.5 regardless of the brand, and that holds true with the Pumas. 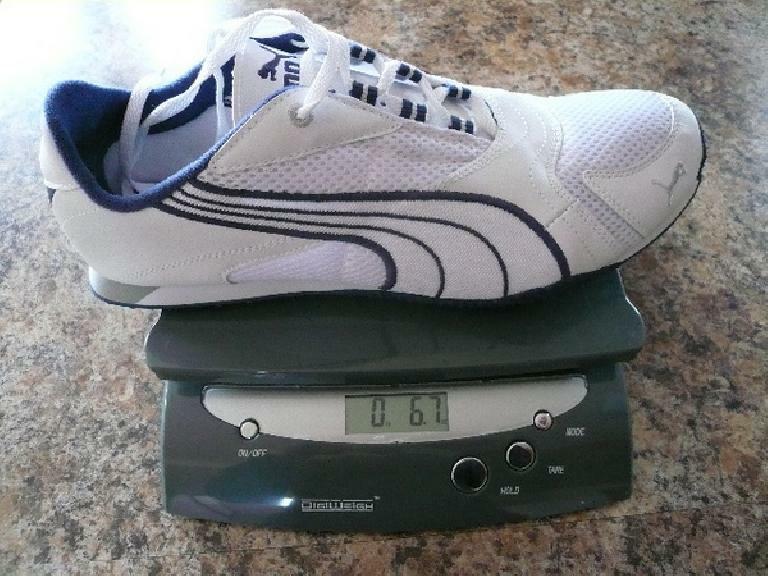 I have also seen on other sites that most people think the shoes run neither small nor large. When I wear my H. Streets, there is ample room (but not excessively so) in front and to the sides of my toes, and I consider my feet to be pretty normal-sized (e.g., not too wide or narrow) for their length. The H. Streets are the most comfortable shoe I have ever worn. In May, I ran a 100-miler with the 95%-similar Puma Salohs (same shoe but with more leatherette on top), and only started to get blisters after 80 miles. Prior to then I have never gotten blisters or had discomfort with the Pumas. What is the UK size of your shoes? I just realized (luckily before I buy them) that the sizes listed are UK sizes, not US sizes. Thank for your article Puma Saloh Review it’s like a sigh of relief for me. I am running 15-20 miles per week just for my health. In about one month ago, at the time to by a new running shoes, I was surprised that about 100% of running shoes in our stores are Cushion, Support and Stability that I feel unnatural and even could be dangerous . I accidentally spotted Puma Saloh in one regular shoes store. I had internal feeling that it is what I need , I searched this name over internet and found your site. how does the huraches compare with these other minimalist shoes? There’s no difference. The platforms are exactly the same, just with different colored rubber. Are you still able to find H Streets and Salohs somewhere? Only found some on Amazon, eBay. The average sizes are hard to come by, but for those heft of foot (! ), there are some out there. My H Streets developed some serious holes in the sole. Any sock I wore on a run quickly developed holes in the same location! 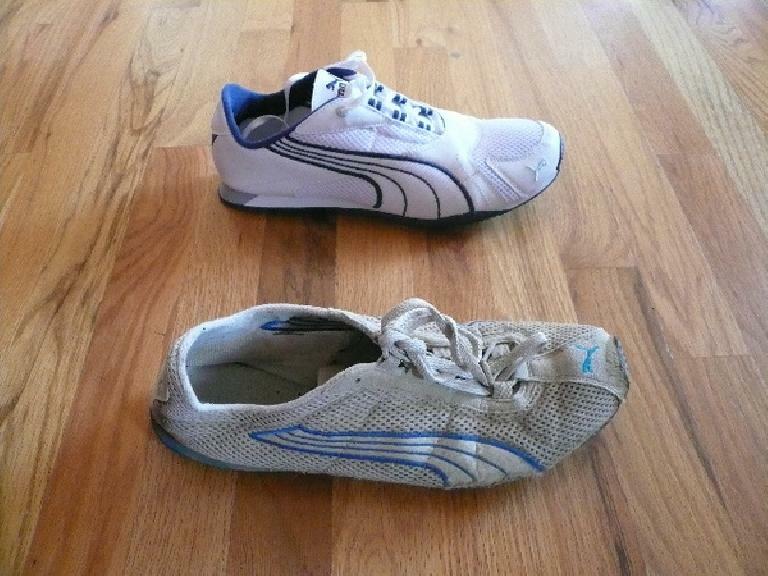 So, I’ve been compelled to order a new pair from Puma. Adam, if you end up getting a pair of the new H-Streets, please let me know how you like them! They look the almost the same as they were before but seem to be a lot more expensive now, so I wonder if anything else had changed other than the price. There are some deals on RetailMeNot (search for puma.com) where I was able to get 20% and free shipping. Total cost for the H Streets were $61.34 ($54.40 before tax). Time to stock up! I have 2 pairs from mid last year and they are wearing very well. I’ve bough Merrell Road Gloves just to see how they felt but I keep going back to the H-Streets! As I am preparing for my first Marathon, I thought of getting something with more protection hence the Kinvara 2….and yet I still keep going back to the H-Streets! Now I can’t seem to find them anymore here in Singapore and would appreciate any link as to where I could buy them online and will ship globally….